Kasma's first cookbook was It Rains Fishes: Legends, Traditions and the Joys of Thai Cooking. 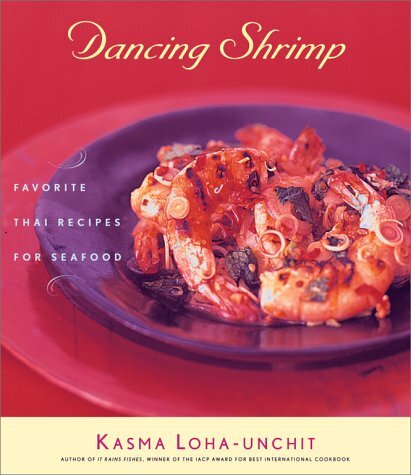 Dancing Shrimp, published by Simon & Schuster is a book of Kasma's favorite Thai Recipes for Seafood including both traditional Thai recipes and Kasma's original recipes. It contains a wealth of information on how to work with a variety of fish, shellfish and mollusks. One chapter contains detailed information about all of the ingredients used in the book – Kasma's husband thinks this chapter alone makes the book worth owning. As with her previous book, It Rains Fishes, the detailed cooking methods,instructions and recipes are woven into a tapestry of cultural imagery, folklore and personal impressions of the country where Kasma grew up. I have been a fan of Kasma Loha-unchit's since first reading her award-winning It Rains Fishes. In Dancing Shrimp she once again gives us a jewel with enchanting prose, extensive information, and delightful recipes. See also Reviews of Dancing Shrimp. Preserved Foods and Flavoring Ingredients from the Sea – Sample selection. Ingredients and Tips for Selection and Preparation – Sample selection. There are a total of 92 recipes. Go on to read Reviews of Dancing Shrimp.